The picture shows a collection of ocean driftwood, which spells JOY. Joy has taken up residence in my backyard. The next two weeks I will be on a "jaunt" (just had to get in another J word). 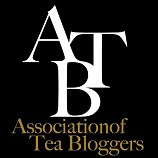 I will be traveling on a road trip with Jim through California and to Las Vegas for the World Tea Expo. There will be many stories to tell on my return. Happy, Joyful Springtime! "It's not easy being green" is the line from a song by a famous frog. Green is a color I have been captivated by this spring. After the brown, dark colors of winter, green has popped out everywhere. All shades of green. I am surrounded by green. The walls in my office are green. I sometimes drink green tea from a green teapot. I look out the window and see green grass. Oh the yellow green of new leaves is everywhere. People are wearing green. I put on a green top at the store and it makes me look like I am sick. Now why can a color that is so beautiful make one look sick? So I wear my green in my world, but not at my face. Kermit, you look so good in green. Now maybe if I were a frog I could wear green. Enjoy the new green of spring with a walk in the park and if you can, wear green. Normally I don't post on the weekends, but I will be leaving for 2 weeks on Tuesday and I have a few pictures and thoughts I just wanted to share. Last weekend my husband and I were at the Oregon coast. Being a Pisces, I love the water and think the coast is so beautiful. If I don't get my desired amount of water regularly, I am not a happy person. Swimming two nights a week suits me just right, but a trip to the coast is even better. Enjoy the beauty of the Oregon coast. Steep a cup of tea, take a breathe, and enjoy the rhododendrons I found in the Crystal Springs Rhododendron Gardens recently. Have a peaceful, flower filled spring day! For Earth Day I decided to take my camera on a walk around my neighborhood and see what I could see. For many of you, you may not like graffiti. I am fascinated by a lot of it. What I saw on Earth Day was the above graffiti, which I thought was appropriate for Earth Day. I was reminded that indeed "this land was made for you and me" and it was up to you and me to take care of it. It has been put in our hands to care for just as we care for our homes and families, we must care for our land. Tread lightly as we walk. This is the final pattern of six that Marmalady's will soon have on the website, www.marmaladys.com. It is a teacup carrier. When I say one of the patterns is a teacup carrier, people look at me and say "why". But for those of you that are tea lovers you will understand that sometimes we love to carry our teacup along on a trip or to a special occasion for tea. I have had several requests for a teacup carrier and finally here is the pattern to either pick out the fabric and make it yourself or have someone make it for you. I tested one on a trip last fall to Europe and it worked great. The teacup is all snuggie in the pouch. A new teacup given to me on Easter by my friend that knows I like yellow. The unusual thing about this cup is that it has a small handle for a large cup. I thought it would be uncomfortable to hold, but it is not. The handle is definitely for a right handed person and is angled to have the very best grip. It is very unique. by a nice cup of tea. Awhile back I showed you the mess in my kitchen with the promise of showing the final results. Here is my 1950's kitchen with a new floor and new paint. One day I would like to replace the handles on the drawers and cupboards, but for now this is my kitchen. I love the space. When I first saw the turquoise I wasn't sure I liked it, but now I do. The labels on the wall above the cabinets are apple box labels from the town I was born in. The one above the sink is the only one left of my grandfather's labels. Out the window above the sink, on a clear day, we can see Mt. St. Helens above house roofs. Mt St. Helens erupted in the 1980's; so it has a flat top now. I hope you have enjoyed seeing my 1950's kitchen. As a young girl I would watch the bird's flying and dream of flying. My hearts desire was to soar through the air like a bird. Building airplanes out of boxes, I would climb to the top of the garage roof, get in the airplane, slide down the roof, and for a moment fly through the air. I would climb high into trees and swing in the branches hoping to be propelled into space. Needless to say, our neighbors feared I would break my neck; but for moments I would fly. There is something so freeing for the spirit to soar. How can we take flight and soar? My heart still rejoices each time I take flight in a plane. Can we only soar in our dreams, in a plane, or in our spirit? Flying is a feeling of laughter, no worries, freedom to be who we want to be, taking risks. Take flight with me today. Let out that breathe we have been holding in, breathe deep and leap! Leap into the unknown, be daring, do that thing you were afraid to do, and rejoice in the trip. Will it be a short trip, a failed trip, or one that takes us to new heights? Whatever it is, for a moment we flew and our hearts soared. First, an urban farmer must have a few flowers. The vegetables are grown in the parking strip. It is planted, ready, and growing under the soil. Now where did that urban farmer get the idea? Baby chicks are keeping warm under a heat light. into their hutch in the backyard when the weather warms up. There are four of them, "The Golden Girl's", the farmer calls them. There is definitely a pecking order to the four. Here is the urban farmer with her chick. Portland seems to be hatching many urban farmers in this time of slump in the economy. What a creative way to supply food needs for your self and those around you. Are you finding creative ways of adjusting to the downward economy? Two patterns come together in the package. This round potholder is similar to one we used at Babington's in Rome. The ribbon hooks onto the top of the teapot and the potholder covers the handle. A friend once asked me to make a butterfly teapot holder. This is what I developed, which I think turned out very cute. Using different contrasting fabrics is fun on this pattern. This is the fifth pattern that will be available in May on www.marmaladys.com. Next week I will share the final pattern of the 6 new patterns developed for you. 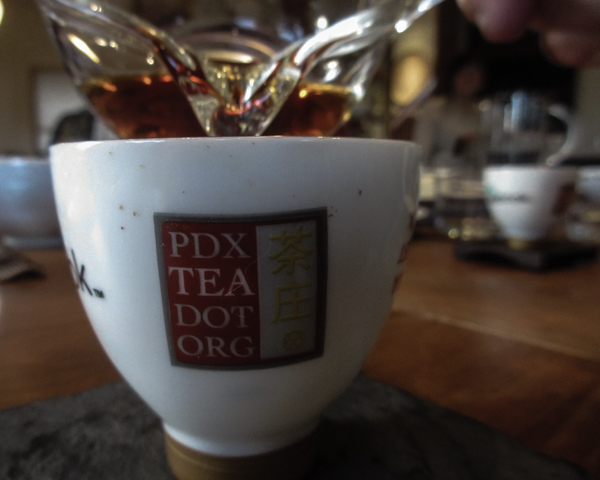 It has been a great project and one I think any tea lover would love. Tammy yesterday commented on the Marbelized Eggs; so I thought I would share the recipe with you. The recipe comes from a small book put out by the Sri Lankan Tea Board on Ceylon Tea. I received it at a past World Tea Expo, tea tasting on teas from Sri Lanka. Hard boil the eggs and cool under running water. Crack the eggs lightly and evenly. Bring the 4 cups of water to boil, add tea leaves, pepper, spices, and salt. Add the eggs and simmer 30 minutes. Keep overnight and remove shells. Note: they suggest serving in a salad, I just served separately in a bowl. Easter in my family use to be the tradition American ham dinner. Then when our two children went off to college and my husband and I found ourselves just the two of us; I decided to serve a small afternoon tea. My husband liked it so much, he said "this should be our Easter tradition"; thus began our Easter Tea. Now the family all live nearby and they also expect Easter Tea each year. 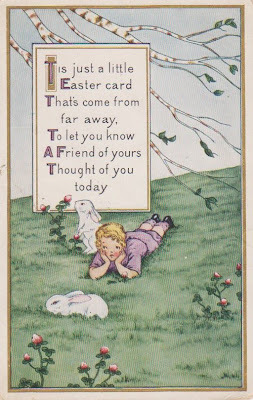 We usually include a few friends which say they feel honored to be included in our Easter Tea. This year we had 11 people share tea with us. We move the furniture around in the living room and set up small tables. It feels like a small tearoom. The food is served buffet style. This year's decoration idea came from Martha Stewart's Living Magazine. It was empty egg shells filled with small pansy's. Then they were tucked into child size teacups. One of my friends, that was in attendance, gives me wonderful gifts of things she finds with yellow. Each of the tablecloths had yellow on them and were gifts from my friend. Most of the little children's teacups also came from her. I think it was our best Easter tea ever. The new tuna recipe was delicious; but more than that the company was special. When our guests left and we were cleaning up, we realized we had enjoyed tea with friends and family for 4 hours. What a special time of sharing. Blessings to each one of you, my dear friends, at this time of celebration! 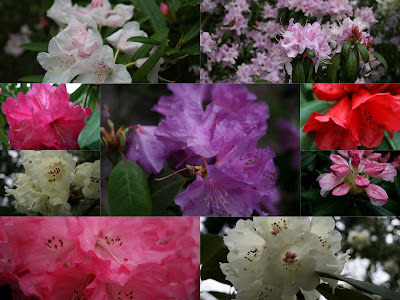 A few days ago I found myself in the neighborhood of the Crystal Springs Rhododendron Garden in Portland. Taking a walk through the gardens I was struck with the vibrant colors of springtime. What beauty was to behold. There is something about new leaves on the trees and the beginnings of life that is so beautiful. There are many more pictures to share on another day. When I started blogging I hadn't really paid attention to the beautiful gardens Portland has to offer. Carrying my camera has helped me to pay attention. If you ever visit Portland allow enough time to take in the beauty of the public gardens. It is pure joy! This is the pattern of the cozy Marmalady's has sold for several years. It is possible to purchase a ready made cozy at www.marmaladys.com. But if you sew and would like your own fabric choice, here is the pattern. The traditional cozy pattern was developed from a cozy I purchased in England. Both of these cozy patterns will be available in May on my website. 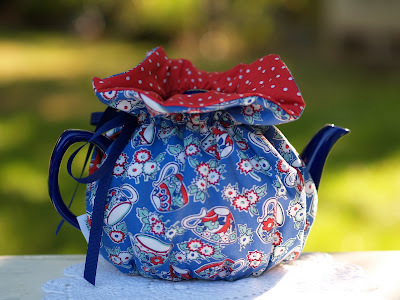 I use the wrap cozy when I am serving alot of tea and want to keep the cozy on the teapot. It is filled with a thermal filling, which keeps the tea warm for up to 2 hours. The traditional cozy I like when I am having tea for just myself and don't mind removing the cozy and then replacing it with each serving. It uses a lofty filling and also keeps the tea warm for up to 2 hours. Now all you would have to do once the cozy is made, is warm up the teapot, make tea, and enjoy! Saturday Jennifer Petersen, Carnelian Rose Tea Co., hosted an afternoon tea, April Flowers Afternoon Tea. It took place at CT Cafe in Vancouver, Washington. The menu consisted of Sliced Egg and Water Cress Sandwich, Cucumber and Smoked Salmon Sandwich, sliced Radish Sandwich, Becon and Egg Quiche, and Veggie Cups for the savories. There also were Cranberry-Orange Scones with Lemon Curd and Jam. The sweets consisted of Chocolate Cream Cheese Cakes, Fresh Fruit Tarts, Lemon Madeleines, Shortbread Cookies, and Russian Tea Cakes. There also was a Jasmine Tea jello in a cup, which was very interesting. I am limitless in my thinking. My divine atom is eternal. I change my life by changing my mind. I have no wrinkles on my soul. Now I am not a Red Hat lady, but I enjoyed getting to know one. My internet is slow this morning; so no pictures right now. I just wanted to let you know who won the give away. The winner of the book, Hidden in Plain View, is Belinda. 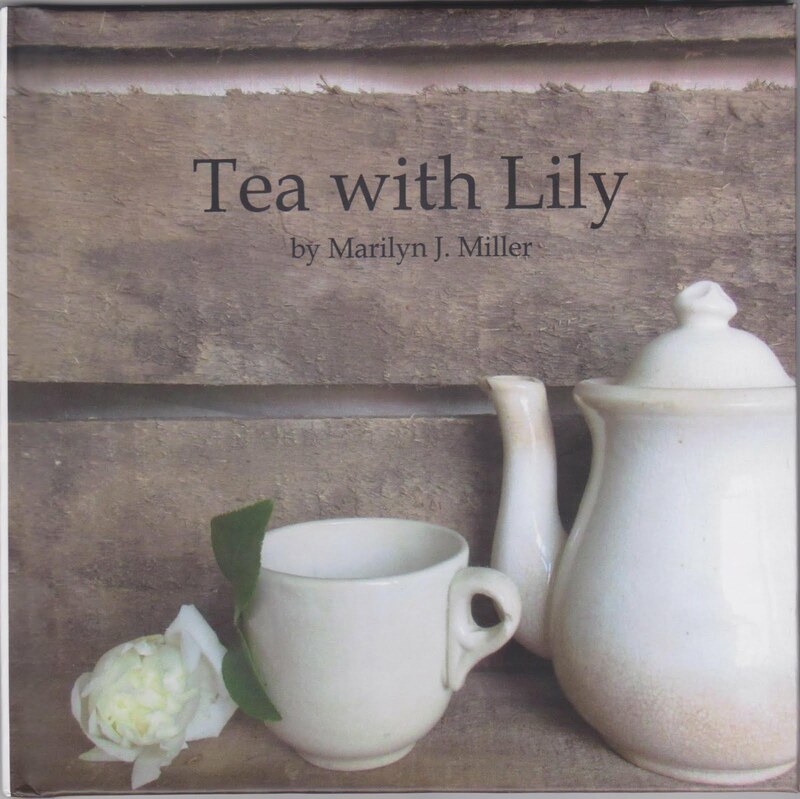 Belinda, please email me at marilyntea@gmail.com with your address and the book will be on your way. I hope everyone is having sunshine on this beautiful spring day! Not to long ago a book came in the mail. I had won it on Paris Parfait. Tucked inside was a French postcard. I collect old postcard, but had never had one written in French. 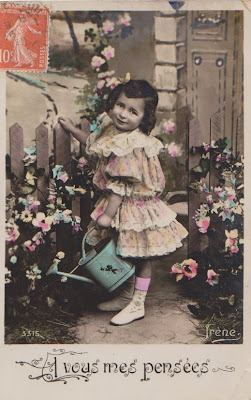 I think this little girl wants to share her pansies with you on this lovely springtime day. Thanks, Tara, for this delightful postcard. This is the final day to leave comments for the drawing mentioned on Monday. When we bought our home I was so impressed that someone planted a camillia hedge on each side of our front yard. There are at least 30 full grown plants. By full grown, I mean we actually have to prune them once or twice a year or they would reach to the heavens. Each spring I am again thrilled to see their beautiful faces appear. I was so excited this morning I thought I would share some of the blooms with you. If you double click on the collage you will have a better look. Some of them still had morning dew on them. I don't often pick them, as they are so pretty right where they are. 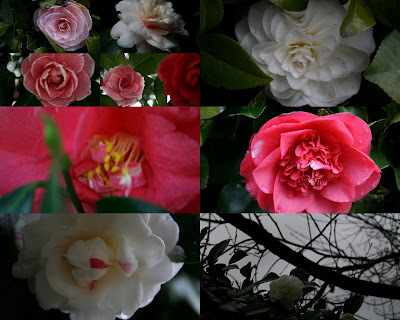 Now did you know tea leaves are from a varietal of the camillia? Take a look at the picture on my side bar of a tea blossom. Don't they look similar? Don't forget to leave comments this week. I will draw a name tomorrow for the give away mentioned on Monday and announce it next Monday. Picture is of my favorite spring teacup sitting in a bird nesting box made by my husband. I have been thinking alot lately about being "In the moment". What does that mean? I understand that when drinking a cup of tea. I can sit quietly, holding a warm cup in my hand, and pause in the moment. Then I read in Simple Abundunce a couple weeks ago about paying attention when we are embracing and talking to others. To stop, look them in the eyes, and take in what they are sharing. How often do you or I really do that, when we are rushing around trying to get just one more thing done? The book says to speak softly, listen attentively, and act as if every conversation you have is the most important thing on your mind today. In Quaker circles we are told to "center down". Bring our core thoughts down to focus on God. A friend gave me an old article from the newspaper and the title was "Take timeout with tea". Am I being told to focus and center, paying attention to each one that crosses my path? This is something I am struggling with right now, as my life sometimes gets very busy and I rush around. I believe many of us probably find ourselves in this state of rushing and not paying attention. Let's all take time today to slow down, sip a cup of your favorite tea, and look in the eyes of those around you. Give full attention to those around you, whether it is petting your dog or cat, talking to your spouse, or returning a faulty computer to the store (as I am doing today). Now this will be the real test for me today. Let me know how it works for you. Don't forget the give away mentioned on Monday's blog. Leave comments this week to be entered into the drawing.